According to a new study published in the Journal of the National Cancer Institute, by using a measure of how tolerant a person’s immune system is, doctors may be able to predict that person’s likelihood of developing certain cancers. Previous studies have indicated that cancer spreads aggressively if there is an imbalance between suppressing and active immune cells in the tumor microenvironment. However, Dr. Rudolf Kaaks, study co-author and epidemiologist at the German Cancer Research Center (known in Germany as the Deutsches Krebsforschungszentrum, DKFZ), noted that the team was unsure if this was a consequence of an aggressive tumor or if it was the cause. Hence, the team set out to discover the answer to this question. 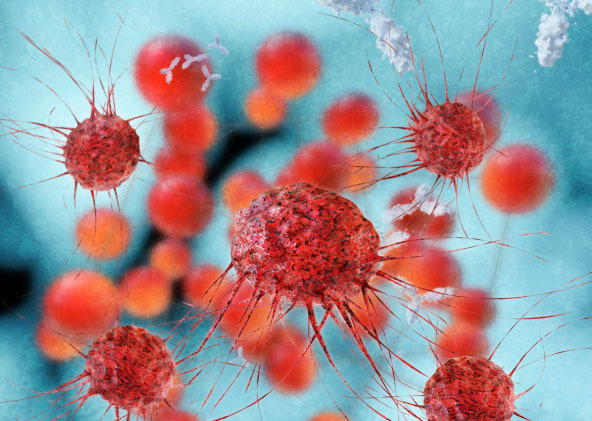 For the study, Kaaks and his research team analyzed the previously frozen blood samples of 1,000 individuals who developed cancer over the period of their follow-up post-enrollment in the EPIC study (a mass study involving multiple research centers that is investigating the links between diet and cancer risk). The researchers chose to focus on cancers of the lungs, breasts, colon, and prostate. The team also utilized blood samples from a group of about 800 people who had not developed cancer. The researchers calculated a way of measuring immune tolerance to cancer cells; they called it immunoCRIT. This refers to the ratio of the number of suppressing regulatory T cells, which inhibit the immune system’s response to cancer, to the total number of immune T cells, including the tumor-fighting T cells. The idea behind the immunoCRIT ratio is that the higher its value, the more the immune system is suppressed and tolerates tumor growth. The team investigated how immunoCRIT scores varied among the EPIC participants selected for this study and how they were associated with any form of cancer development. They discovered that if the immunoCRIT value is increased, a participant’s risk of developing lung cancer rose by 100% and their risk of colon cancer rose by about 60%. Researchers also discovered that women with very high immunoCRIT scores are at triple the risk of developing estrogen-receptor negative breast cancer. However, researchers are not confident about this finding as they believe the case number is too low. In cases dealing with prostate cancer and estrogen-receptor positive breast cancer, they found no significant links between immunoCRIT scores and cancer risk. Dr. Kaaks concluded by adding that the study should be seen as a breakthrough because the findings demonstrate—for the first time—that the “unfavorable ratio of immune cells” pre-existed the development of the cancer. For this reason, Kaaks and colleagues believe that a lack of immune tolerance may be the cause, and not the result, of certain cancers. Barth, S.D. et al., “Treg-Mediated Immune Tolerance and the Risk of Solid Cancers: Findings From EPIC-Heidelberg,” Journal of the National Cancer Institute 2015, doi: 10.1093/jnci/djv224. “Tolerant Immune System Increases Cancer Risk,” EurekAlert web site, October 6, 2015; http://www.eurekalert.org/pub_releases/2015-10/gcrc-tis100615.php.